Porcini Mushrooms, Montepulciano d’Abruzzo, Black Squid Ink, Chili Pepper and Rocket. Let your appetite be whetted by the genuine perfumes and tastes of the sea and the mountains. 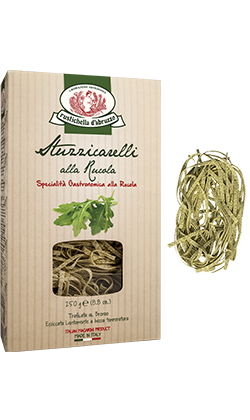 Rustichella d’Abruzzo proposes Stuzzicarelli line, a type of pasta similar to Tagliatelle but slightly narrower made with top quality durum wheat semolina and fresh eggs, bronze drawn and slowly dried at low temperature. Every dish is a party with Rustichella d’Abruzzo Stuzzicarelli, not only on Sundays. 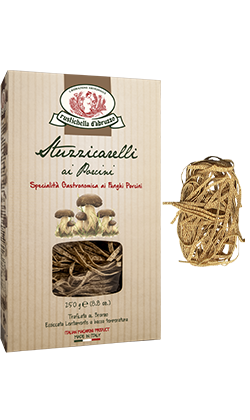 Rustichella d’Abruzzo Stuzzicarelli ai Funghi Porcini carries the irresistibly intense taste of earth and tradition. Try it with sausage, Abruzzo Pecorino cheese and a bit of Rustichella d’Abruzzo PrimoGrano INTOSSO monocultivar Extra Virgin Olive Oil. Try it also with our ‘ai Funghi Porcini’ sauce or with ‘alla Genovese’ sauce. Cooking time: 4 minutes. Rustichella d’Abruzzo Stuzzicarelli alla Rucola has the right mix of tradition and a healthy and well-balanced lifestyle. Made with top quality durum wheat semolina, fresh eggs and fresh rocket powder, this type of egg pasta is just perfect for all the “healthy” recipes: with a vegetable pesto with toasted pine nuts, Abruzzo Pecorino cheese and Rustichella d’Abruzzo Extra Virgin Olive Oil, or with roasted cuttlefish, parsley and Rustichella d’Abruzzo PrimoGrano INTOSSO monocultivar Extra Virgin Olive Oil. For the health enthusiasts, we recommend it with our organic Pesto alla Genovese or with ‘al Pistacchio di Bronte’ one, with a bit of Rustichella d’Abruzzo organic Extra Virgin Olive Oil. Cooking time: 4 minutes. 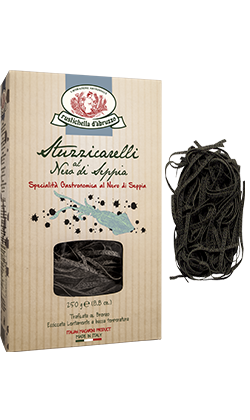 Rustichella d’Abruzzo Stuzzicarelli al Nero di Seppia, made with top quality durum wheat semolina, fresh eggs and natural Black Squid Ink, brings to your table the best seafood recipes. Try it with salted codfish, mullet’s eggs, parsley and Rustichella d’Abruzzo Extra Virgin Olive Oil, or season it with our ‘Vongole alla Marinara’ sauce with a bit of Rustichella d’Abruzzo PrimoGrano INTOSSO Extra Virgin Olive Oil and parsley. Cooking time: 4 minutes. 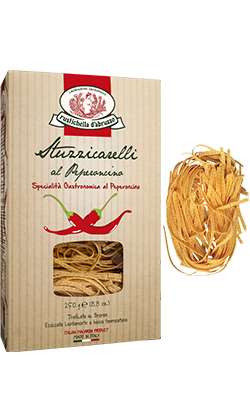 Rustichella d’Abruzzo Stuzzicarelli al Peperoncino could not be missing, for the lovers of spicy tastes. Made with top quality durum wheat semolina, fresh eggs and chili pepper powder, we recommend it with Pecorino cheese fondue and crispy cheek lard, or with our ‘alla Genovese’ or ‘Vongole alla Marinara’ sauces. Cooking time: 4 minutes.